RV Prince Madog is owned and operated through P&O Maritime Ocean Services (POMOS), a joint venture between the University of Wales, Bangor (UWB) and P&O Maritime. Built by Visser Den Helder, The Netherlands, replacing an older ship of the same name, she entered service in 2001 and is based at Menai Bridge, in North Wales next to purpose-built onshore facilities. The Prince Madog is able to mobilise quickly for a rapid response or opportunistic access to events yet can support longer experiments and surveys when required. 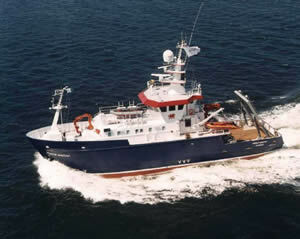 She mainly operates within UK waters and is capable of working from close inshore to the shelf edge. Laboratory spaces can be reconfigured to suit each cruise's objectives and specialist equipment easily fitted as required. She is available for academic or commercial charter, by members of the marine science community and is also used as a teaching platform, by the School of Ocean Sciences (SOS) and other UK universities to train the next generation of marine scientists. In addition to the details provided in the CARBON-OPS data inventory, more information about RV Prince Madog cruises is available via the UK Cruise Inventory.